Very spacious and clean 4 Bedroom home with 2 double vanity bathrooms. Fully air-conditioned throughout. Garaged car park. 15 to 20mins from city. Internet included. 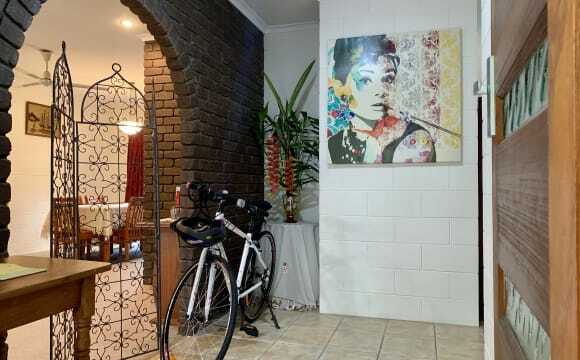 More photos upon request ... $190 per week Modern beautiful home in quiet street in Bentley Park. 150 meters away from a bus stop through the pathway. 2 bedrooms available, 2 big bathrooms, 2 toilets. Updated, freshly painted and new carpet in all bedrooms. All bedrooms have ceiling fans and Aircon. Huge living dining area with brand new Daikin Aircon. New range hood and dishwasher. 65" UHD TV in the kitchen / living area. We're two guys looking for another male housemate around our age - sorry ladies. My house is just off Robert Road in the northern end of Bentley Park. We're a quick 10-15 min drive into town, or short walk to the 140 or 142 bus. One is room available in a four bedroom house. The room is unfurnished, however has a built in wardrobe and a brand new air conditioner. You will have share of the main bathroom. Driveway and street parking are available. No smoking inside. Outdoor pets are negotiable. We have a huge swimming pool and backyard for hanging out. There is a study and another bedroom which is set up as a spare room for guests. Unlimited NBN internet, Netflix and water included. Electricity is extra. Furniture different to photo will include and queen bed and built in robe. Aircon included. Will have access to lounge which is un used. Beautiful outside area with BBQ, with great views. Fully furnished kitchen all appliances can be used to your needs. 15 mins from town. 5 mins to Coles and gyms. Owners will be away for 5 weeks so if needed week before or few weeks after the month of may we will be able to work something out. Will have a cleaner in doing majority of household chores but will need to keep your own room clean, dishes etc. Nice clean and tidy 3 bedroom house in quite cul de sac. Fully furnished and aircons in every room. Looking for a professional, working person to share with 1 other. Must be reasonably tidy and clean. 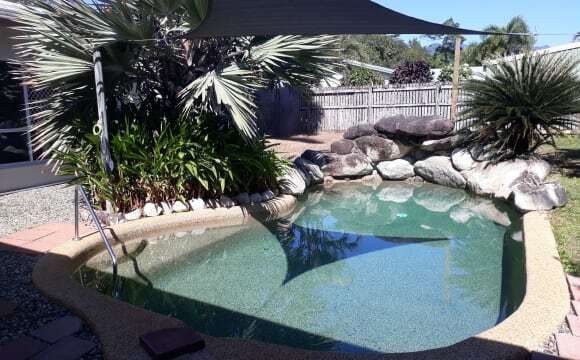 Property features outdoor living areas, aircon and swimming pool. Room is master bedroom with queen bed, large waldrobe, air con, a desk (if needed) own private entry/exit to house along with private door through to bathroom (although bathroom is shared). On road and off road parking is available. 10-15 min drive to CBD. No pets. No partys. Hi, I'm looking for tidy and respectful person between 20-30 to rent a double room in a 3 bed 2 bath house. Room has aircon, fan and wardrobe. Bathroom will be shared with just one other person. Bedroom can be furnished or unfurnished, the rest of the house is furnished. Rent includes internet but not power. House is located 2 min walk from Mt Sheridan Plaza, 10 min drive into the city. There is also a bus stop just around the corner. Non-smokers please. 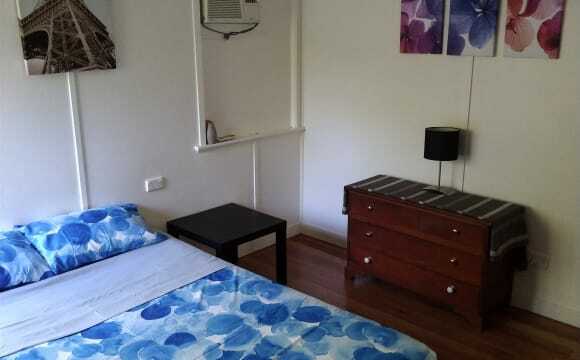 The room is $150 unfurnished or $155 with a single bed or $160 with a double bed. The house is situated in a quiet, friendly street of only 10 houses, it has a BBQ &amp; back patio with partial views of the mountains, it is close to the Mount Sheridan shopping centre, daycare centres, schools &amp; a bus stop. There is a park 5 minutes walk away that has basic gym equipment and next to that is a bottleshop, takeaway &amp; small grocery store. The room is air conditioned. Non-smokers preferred but will accept if it is outside. I have animals that are allowed indoors so an animal lover is a must. Relaxed household, close to town. I own a large house with 4 bedroom 2 bathroom, 2 car lockup garage, which I built in 2014. 800m² yard, deck, pool table, Jacuzzi available. You will have your own room - fully furnished with a queen bed, desk and chairs, large built in robe, and your bathroom to share with another roommate (I have my own ensuite). 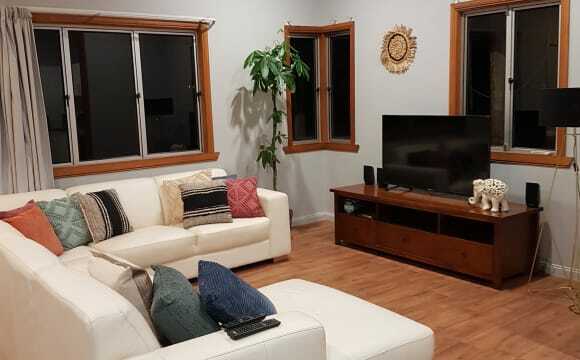 I have a huge living area that I almost never use, with 80" tv, surround sound, Netflix, media pc, gaming consoles etc... All bills (electricity, water, internet) inclusive. I have 100/40Mbit NBN with unlimited downloads and static IP. Fully air conditioned, new Fujitsu splits. Modern kitchen with stainless steel appliances, dishwasher and Nespress coffee machine. Fully furnished, with laundry - please supply your own detergents, and any other consumables. Smokers okay (outside only) and pets considered. Only 13minute drive to CBD. Large spacious house. The house is fully furnished and air conditioned with unlimited wifi. Netflix and stan available. Short 10 minute walk to sugarworld shopping centre/MacDonalds. Garage spaces are taken but there is off-street parking available next to the driveway. Storage space available in the shed outside. There is a creek behind our house with a park just up the street. 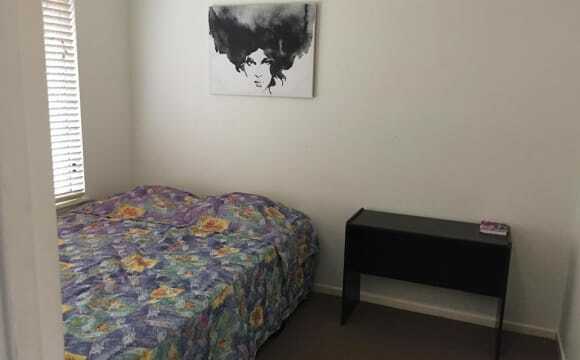 The room for rent has an en-suite which is shared with one female. Room is furnished with a double bed and built in wardrobe with a large mirror. Fully Airconditioned house with a beautiful view overlooking the forest gardens/white rock suburbs. My apartment is pretty luxurious so I'm looking for someone neat and tidy who will respect my property. 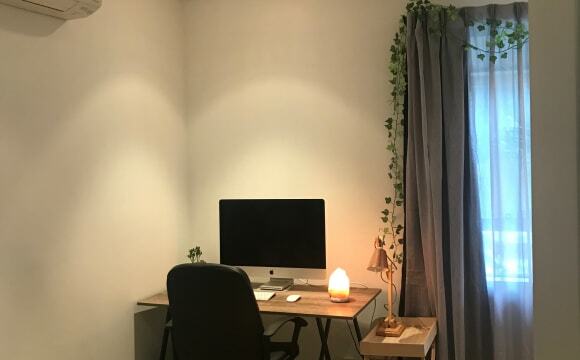 It's a 3 bedroom apartment but one room is an office which you're welcome to at any time. The apartment is freshly painted and has new aircons and appliances as well as two TVs. There are 2 carparks that come with the apartment. The living room and master bedroom overlook the golf course and there is a large resort style swimming pool and tennis court in the complex. Unfurnished air-conditioning room for rent in 5 bed room house. In very quite &amp; clean Mt Peter Estate. Close to park, bus stop &amp; shops. Inc electricity, water, gas and internet. The great things about living in this property is Surrounding by picturesque mountain ranges, it truly feels like coming home. it is also a brand new suburb and all houses are new.The attractive uniqueness of Mount Peter is immediately evident as you enter through the impressive entrance and pass the lovely park, complete with a basketball court, play &amp; exercise equipment. it is only 25 minutes’ drive to the Cairns CBD, Mount Peter is within easy reach of shopping; community facilities, schools and sports fields, and just moments from the Bruce Highway. the room has air corn and fan. it is a furnished house and you will have a car park, washing machine, fridge, electricity included in the bill, you will also have unlimited internet include in the rent and a Telstra TV where you can access all your favorite movies. No smoker please as I'm very sensitive to the smell of the smokes. I'm looking for a friendly person who is neat and respectful. I love living in this property, it is new suburb, new houses and clean. Mount Peter is immediately evident as you enter through the impressive entrance and pass the lovely park, complete with a basketball court, play &amp; exercise equipment. Surrounded by picturesque mountain ranges, it truly feels like coming home. It is approximately 20 minutes’ drive to the Cairns CBD, Mount Peter Estate is within easy reach of shopping &amp; community facilities, schools and sports fields, and just moments from the Bruce Highway. Everything is included in the rent in this property includes internet, electricity, and water bills. Entertainments never end in this house because you will have Netflix, Scan, Hayu and you will never miss out of any of your favourite TV shows because you can catch up at any time of the day. Do you love outdoor I have a big BBQ outside you can cook and relax enjoy the beautiful view of the mountain while enjoy your meals with friends or just you. 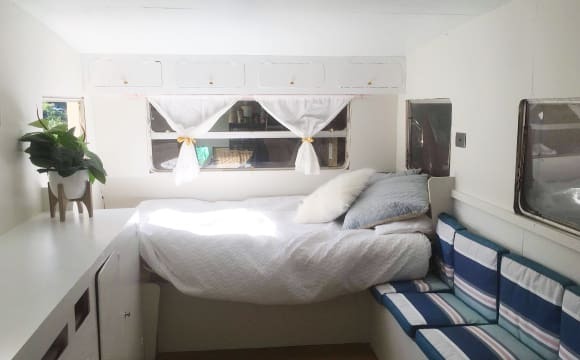 I am renting out my totally restored 16ft retro caravan located undercover at my home in upper Bayview Heights (please note photos show caravan outside however it is now parked under the carport with security cameras connected to the house). The tenant will also be welcome to use the beautiful 3 story house overlooking the City and Reef. The caravan is of decent size with electricity and has air conditioning, plenty of storage, 1x double bed plus 1x single bunk bed which can also be used as a wardrobe plus furnished with a a fridge, microwave, portable oven / cooktop, tv, shelving, 4 seater sofa, lamps and more. The house is quite large and has 1 main bathroom and a second bathroom (no queue to use a shower). I live self-contained in the top level of the house and have no need for the other level or caravan so I rent them out. I run a couple of businesses from home during the week and DJ on weekends so generally pretty busy. The other housemates are in their mid 20s work during the week and are very respectful, clean and get along great (we are all good friends). Selected tenants would be expected to share in the occasional bathroom cleaning duties and be considerate of others in the home. 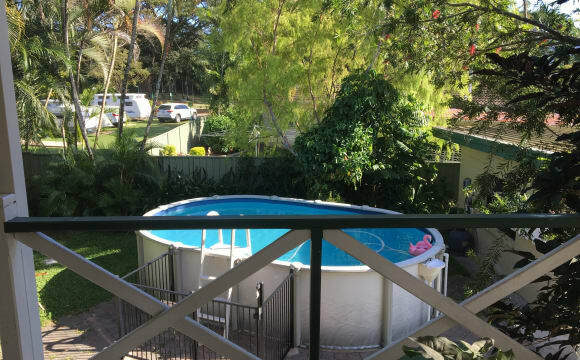 The weekly rental price includes all utilities and unlimited NBN internet. Air Conditioned Granny Flat with private access. Granny Flat features two rooms (bedroom and living area), bathroom with shower and a private balcony with a BBQ and table/chairs. Wifi and electricity included in the price. Two private entries into property. First entrance is via deck/sliding door which takes you into the lounge/dining/kitchenette. Furniture provided in this room consists of: - Two seater lounge suite - Built in dining table with two chairs - Cupboard for pantry - Fridge/Freezer - Microwave - Small Oven Second Room features: - Double Bed - Cupboard - 9 Cube Shelving - Bedside tables - Desk All furniture can be removed as needed and a washing machine can be provided. Anyone welcome, but due to a dog already on the premises, no pets please. More than welcome to have guests in your flat, but I do ask that there be no parties or excessive noise. It is a nice, clean house. Decent TV and internet works about as well as you can expect for Cairns. Clean modern kitchen, I just put in a new oven and stove. All bedrooms are air conditioned. It is the main bedroom (4 x 4.2m with built ins) I am looking to rent out, I am quite happy in the other one. The room will easily fit a queen bed in it and there is a full wall of built in wardrobes to fit stuff in. At the moment I don't have netflicks but if it was a deal breaker then it could be arranged, I wouldn't use it enough to justify it for just me. Again if the internet plan needed to be upgraded we could work something out. It is in Earlville, walking distance to Stocklands (Gym, cinema and shops) and the Barr St Markets. It's a beautiful leafy house, Queenslander style in an older quiet suburb of Earlville near Stocklands. It has 3br, timber polished flooring, good sized yard &amp; fully fenced. Less than 10 mins drive to the City! The house is situated in a small Close, in an elevated position in Upper Mooroobool. 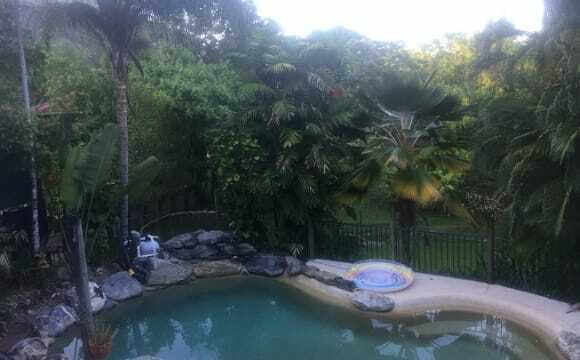 It has a fabulous, extra large pool surrounded by lovely well-established tropical gardens, including a Fish Pond Water Feature, and a Bird Bath. The house has an outdoor area, lots of gardens and fruit trees, is very private, fully air-conditioned, and has a modern kitchen with quality appliances. There is currently a good quality, Queen size bed and clean mattress, desk, chair, bedside tables and a brand new split system air-con in the bedroom. Built-in wardrobes have HEAPS of storage, including shelving as well as hanging space. This is a very comfortable, clean, light and airy home. I’m looking to share with someone who is honest, clean, quiet, respectful, and hopefully a long-term housemate! The property has four sparkling bedrooms - 3 x Queen ($180 per week per room) and 1 x extra large single. One queen room is available now. All bedrooms are lockable and most have direct access to the front or back yard - the available room has such direct access to the front yard. Each room has a new, quality bed, wardrobe, fan, air-con, bedside table with lamp, and desk. WiFi and Netflix are included in the rent. The living room has a brand new 55 inch smart TV and the kitchen is fully equipped with everything you need for a comfortable stay. There's an above-ground pool and undercover entertaining area to help you relax. A gas-fired BBQ is available for your use. The common areas are cleaned by an external cleaner each week. 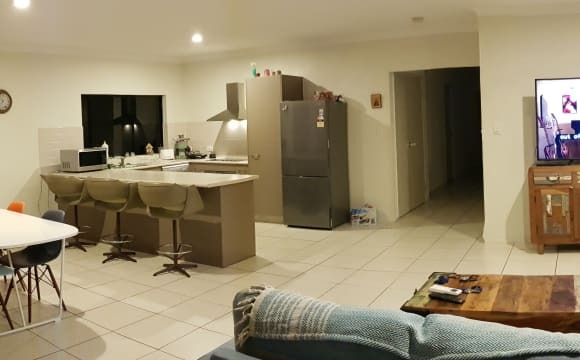 A mere 500m from Stockland shopping centre and 10 min drive to the Esplanade, the house is in a very quiet location with public transport on the doorstep. We also allow the tenants access to the secure shed to store bikes and other personal gear. The current group of three tenants (one boy, two girls) are very sociable and get on well. 12 min drive to Cairns City. 5 min walk to bus stop. Clean, tidy, comfortable 2 storey queenslander. Downstairs is self contained (kitchen, bathroom and living area) very seperate and private to upstairs. This downstairs room for $150 has 1 or 2 single beds, (which ever is your preference) The room for $200 has the queen bed.